Almost 15 years ago a brutal attack by a violent psychopath changed everything. 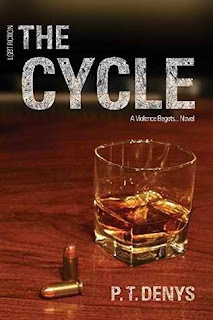 In Violence Begets... despite horrific child abuse, Rick St. James and Kevin Vincent were able to find love in each other. They discovered that violence only begat violence when they allowed it to. Now Rick's little brother is faced with the same painful reality that Rick once had to endure. Returning home to help his brother causes the nightmares of the past to crash and merge with the demons of the present. Love is put to the test and it may not be strong enough to survive The Cycle! I’m not sure I am going to be able to convey just what this book did to me, what this author did to me. 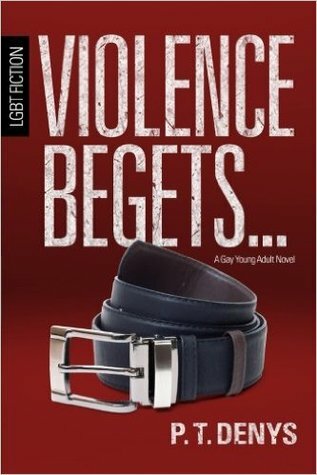 I should have learned my lesson from the first book in this series, Violence Begets, but hope had me thinking the author wouldn’t put me through that again. Surely there had been enough suffering? And after the end of Violence Begets I was thinking just what could and would happen? PT Denys is nowhere near finished, this author has the knack of literally destroying me emotionally, ripping out every single emotion she can until I am wrung dry. I cried a river, I was sobbing my heart out to the point I couldn’t read because the tears made everything blurry, to the hiccupping, wracking sobs. These characters made their mark in the first book, they were truly indelible by the end of this one. I am not going to say anything about this book, I’m not even going to mention characters because everything is a spoiler. You definitely need to have read Violence Begets before reading this one as this story continues many years on from the end. This book is a rollercoaster of epic proportions, as I said above, my emotions were all over the place from love, to anger, to sheer agonising pain, empathy, happiness, disbelief, to total and utter devastation. Like I said one EMOTIONAL roller coaster. But this is kudos to PT Denys, because she delivered, she didn’t just draw you in, from the very first word you were sucked into one heck of an emotional vortex, like a whirlpool that spun you round and round and spat you out at the end, battered, bruised and crushed. PT Denys stuck to her guns in this book and like I said in my review of Violence Begets “This book is emotional and will have triggers for many people but I have a huge amount of respect for the author…this book screams I am brave, I will write what I want and how I want, it is my story and I will tell it how I want to, I will write from the heart, I will bleed onto the page, it won’t be pretty but it will be real and it is mine, my story. It isn’t generic, it is definitely not cookie cutter, it is unique and I loved every single word.” That statement still holds true. M/M books can be a much of a much, but I have never read an M/M book that has destroyed me like these two books have, destroyed me in the best way. I live for books that make me live and breathe a story and this author has had me living this nightmare from the first word of Violence Begets. I have seen these characters grow from kids to men, but the horrors are still ever present, the scars still visible, both physically and emotionally, the repercussions still a threat. This was raw, but it was honest and it was real. This book tackles many difficult subjects but as with the first book I would not have expected anything less. This author has balls and she is not afraid to use them and she exerts them to the best of her ability in this book. To be honest, I am literally broken. This was one of those books that had me looking around thinking, what the hell have I just read? One where it takes hours to digest, one where it took a night’s sleep to be able to form any coherent thoughts, one where I thought, now that was a bloody amazing book, one that made my sleep fitful, one that consumed my dreams and one where I needed to get my thoughts and opinions down as soon as I woke. I’m truly at a loss. There is so much I want to say but I can’t because you need to read this as the author intended, you need to experience the highs and lows for yourself for you to truly appreciate their emotional impact. This book is eye opening, this book goes some ways to make you understand that even decades on, abuse never leaves you. The implications are just as far reaching as they are devastating. However, it also goes some ways to showing that even the most broken of hearts can still beat for the right person. This book showed inner strength, the power of love and trust and the ramifications when they are broken. The mind is a fickle beast, it is one we take for granted and yet it has the power to heal and to decimate. While I’m sitting here rocking in a corner, contemplating how I am going to put my fractured heart back together, I will be patiently waiting for the next one. While this one was years in the making, I am hoping that I don’t have to wait that long this time. PT Denys needs to put me out of my misery, smartish. Seriously though, if you have not read this series, this is a must read. It is not just an M/M book, it is so, so, so much more. Yes, it can be painful, but it is seriously so well written that you cannot help but be amazed by their content and their characters. ADORED this book even though it killed me.